Integration with various facets of practice management is key. You need to be able to record data from an examination as well as easily code and bill. Not only should clinicians be easily able to enter and interpret data but also your front office staff should be able to securely use the software to schedule examinations, update recalls, and bill patients accurately. Communication with patients is a newer feature of many EHRs, which can be achieved either through a direct messaging system or a patient portal. Depending on your practice needs, the patient can simply ask questions online to front desk staff or clinicians and even schedule appointments. If your setting sells goods as well, it can be possible for patients to order directly through this system. Communication with other medical professionals should ideally have interoperability so that it is simple to securely send and receive both communications regarding patients and necessary health care data. Customizability is an important feature of the EHR you select. Psychologists, optometrists, neurosurgeons, and physical therapists all have vastly different modes of practice that can render some EHRs useless. Even within a given field and setting, different health care practitioners may wish to have data presented in their own way. Being able to track trends and data on patients—in a meaningful and flexible way—is of great benefit to any health care practitioner. Due to the plethora of information generated during modern examinations, being able to hide data while keeping it accessible and bring pertinent information to the forefront with alerts and notifications for lab results, drug interactions, and upcoming tests and examinations is important to make patient care more accurate and efficient. In my past experience, one common problem with EHRs has been providers that flood the charts with useless information such as cutting and pasting previous results to carry forward. This can result in mountains of raw data to scroll through or template letters with little usable information and actionable intelligence—a distinct liability in any busy practice. Web-based EHRs have significant advantages that enhance patient care. In settings with multiple practitioners and locations, it is easier to update data securely and review records instantaneously from any device that can access the network or cloud. This makes responding in detail to a patient’s question or request easier and more efficient regardless of whether you are in your office or not. The administrative facet of a good EHR is the ability to generate a varied set of practice management metrics. This could provide valuable information like appointment statistics, which could reference a particular patient or the provider for calculating productivity, referral sources, and rate of flow of patients to name a few. This is a very useful part of an EHR because it cuts down on the time spent manually collecting this data and analyzing it. Based on the data, changes could be made to the particular area to improve optimization. 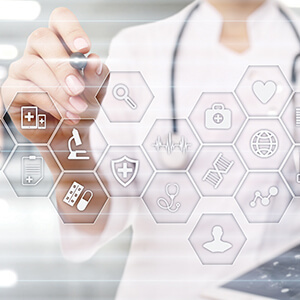 As we can see, electronic health records offer significant advantages over simple electronic medical records by using customizable, integrated systems that cover every aspect of a patient’s care and allow providers to quickly and easily communicate with both patients and other providers from any location. The desirable systems streamline scheduling, coding, and billing with meaningful use to improve a practice’s bottom line and allow tracking and reporting of patient trends. A well-chosen EHR can make the difference between success and failure as a practice. Stefan Young, OD, is currently an optometrist at Kaiser Permanente in Springfield, Virginia, and previously practiced in both private and LensCrafters settings. He can be reached at stefanyoung71@gmail.com.